Drishyam Films, in partnership with the Sundance Institute, USA, is organising the Drishyam-Sundance Screenwriters Lab 2016 to be held in Jodhpur, Rajasthan in March, 2016. The Lab is inviting applications as a part of its Open Submission Process. The deadline for submission of scripts is November 10, 2015. The Lab is for filmmakers making their first or second narrative feature; co-writers, writer/directors, or writer/director teams are encouraged to send in their scripts, which should be independent in terms of story and spirit and also in terms of budget. The Drishyam-Sundance Screenwriters Lab will provide an opportunity for writers to develop their work under the guidance of accomplished international advisors in an environment that encourages intelligent storytelling with a global scope. In order to apply, filmmakers must submit a complete draft of a screenplay as well as supporting materials (cover letter, artistic statement, bio, synopsis of project, and directing sample if applicable). 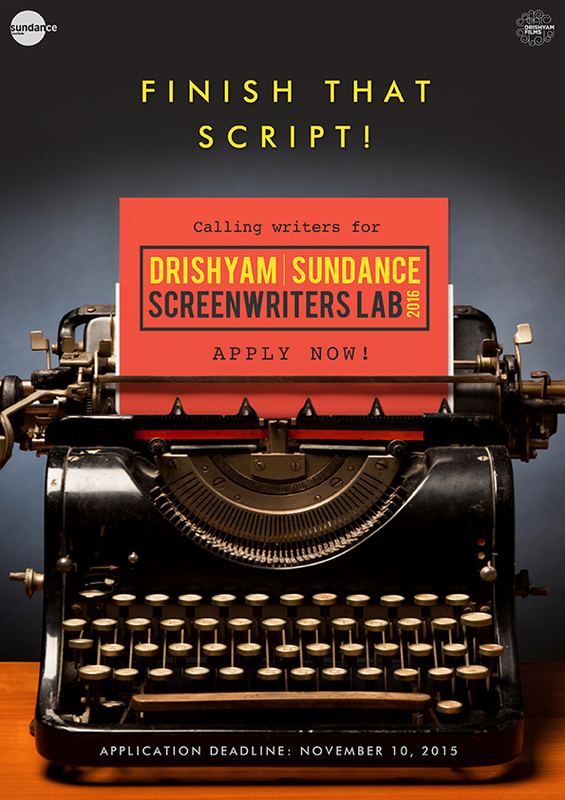 Interest and inquiries should be directed to drishyamsundancelab@sundance.org and a detailed step-by-step process can be followed from http://applications4.sundance.org/res/p/drishyam/. Taking forward the immense success of Drishyam’s first collaboration with the Sundance Screenwriters Lab in Goa earlier this year, the second edition is to take place in Jodhpur next year. A beautiful heritage city in Rajasthan, Jodhpur is a significant distance away from Mumbai for a diverse group of aspiring and emerging writers and mentors to have a refreshing and productive exchange. More information to follow in the January press release. Sundance Institute is a global nonprofit organization founded by Robert Redford in 1981.Through its artistic development programs for directors, screenwriters, producers, composers and playwrights, the Institute seeks to discover and support independent film and theatre artists from the United States and around the world, and to introduce audiences to their new work. The Institute promotes independent storytelling to inform, inspire, and unite diverse populations around the globe. Internationally recognized for its annual Sundance Film Festival, Sundance Institute has nurtured such projects as Born into Brothels, Trouble the Water, Son of Babylon, Amreeka, An Inconvenient Truth, Spring Awakening, I Am My Own Wife, Light in the Piazza and Angels in America.